In a recent study carried out on dogs in Chile, the authors said: "Conservationists in Chile and elsewhere see urgency in controlling the impact of free-ranging dogs on wildlife." "Predation and harassment by dogs has been documented for the majority of larger terrestrial mammals that inhabit Chile, including the three species of canids (mammals from the dog family) and three species of deer," Eduardo Silva-Rodriguez, one of the authors of the study, told the BBC. "It's quite a matter of serious concern," Piero Genovesi, head of the invasive species specialist unit at the IUCN conservation body, told the BBC. "As the human population rises, so will the number of dogs, and this problem could get worse." 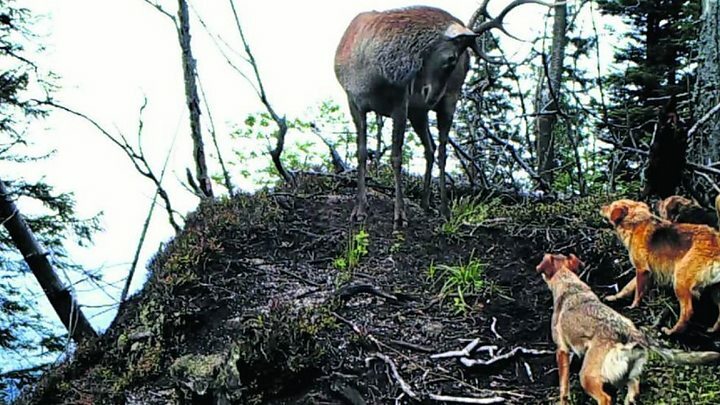 "Through our camera traps we have found that dogs enter caves where lynx take the prey animals they have killed, and we have footage showing dogs eating the carcasses," said Izabela Wierzbowska, a scientist at the Jagiellonian University in Poland. "We have also noticed that the lynx gets very disturbed when it finds out that there was another predator in the cave feeding on its prey." In Chile, nearly 70% of pudu, the world's tiniest deer, that were brought to rehabilitation centres were attacked by dogs, according to a study published in the scientific journal Oryx. 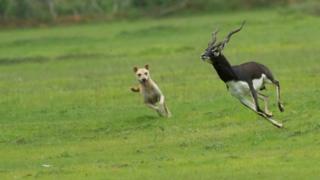 In India's Rajasthan state, less than 100 great Indian bustards, an endangered species, remain and even they are being threatened by dogs. "This problem has been going on and growing in the Indian Himalayan region for more than 10 years now," says Abi Vanak an invasive species expert, who has authored a number of reports on the issue. Some experts say that wildlife in many parts of the world have been hit by the transfer of diseases from dogs - and this is much the more significant problem. "Direct poaching by dogs is less of a threat, but the main issue is the spread of diseases from dogs to wild animals, notably rabies and canine distemper," said Arnulf Koehncke, director of species conservation with WWF in Germany. "And that poses a threat to wolves," says Moritz Klose, from WWF. "If this continues to grow, we will lose the purity of our wolves' genes." "Killing campaigns to reduce or eliminate dog populations is not only inhumane but ineffective, creating a population vacuum that is quickly filled by an influx of new dogs from other areas," says Kelly O'Meara, Humane Society International's Vice President of Companion Animals. Unless that happens - and with populations of humans and dogs on the rise - wildlife will likely continue to be threatened.